Jordan Thompson twice came within a point of defeating Richard Gasquet at Kooyong’s AAMI Classic today, a magical result, according to the commentator, that would have equalled Lleyton Hewitt’s defeat of Andre Agassi at the Adelaide International in 1998. He didn’t precisely come out and say that victory for Thompson would have established the youngster on a course leading inevitably to the world number one ranking, but I like to think he implie d it. Alas, though it was a fine performance from Thompson – memorable, even, if not magical – he lost. He’ll have to get to number one the hard way. Channel 7 works hard to promulgate the idea that the AAMI Classic is something more than a mere exhibition. Their coverage deliberately makes no distinction between the action occurring in Sydney, an officially endorsed tour event, and Kooyong, a round robin exhibition event conducted in a perennial gale that no one involved seems to take very seriously. A few years ago Bernard Tomic stole an umpire’s shoe during a match; another magical moment in Australian tennis. The year before that I think he beat Novak Djokovic, a result that clearly rocked the Serb to his core. A strong performance at Kooyong historically serves as no sort of form guide for the Australian Open, let alone for the tennis fortunes of an entire nation. Recall how Andy Roddick beat Roger Federer in the Kooyong final in 2007, but was then famously drubbed by him two weeks later at Melbourne Park? Hewitt won Kooyong three years ago yet subsequently lost in the first round of the Open. Of course, I disapprove of ‘exhibition’ as a blanket term, since it obscures more than it reveals. The Hopman Cup boasts neither APT nor WTA approval, but it’s still a weightier affair than, say, Federer’s charity match with Jo-Wilfried Tsonga in Rod Laver Arena tonight. For importance, Kooyong is positioned nearer the former than the latter, but that doesn’t mean any of the players necessarily care if they lose. At worst they shrug at the gusting breeze. Usually they just smile with withering wryness. The eagerness to unearth future champions is consuming for the local broadcaster, and if potential is what you’re determined to uncover it’s inevitable you’ll find it everywhere. 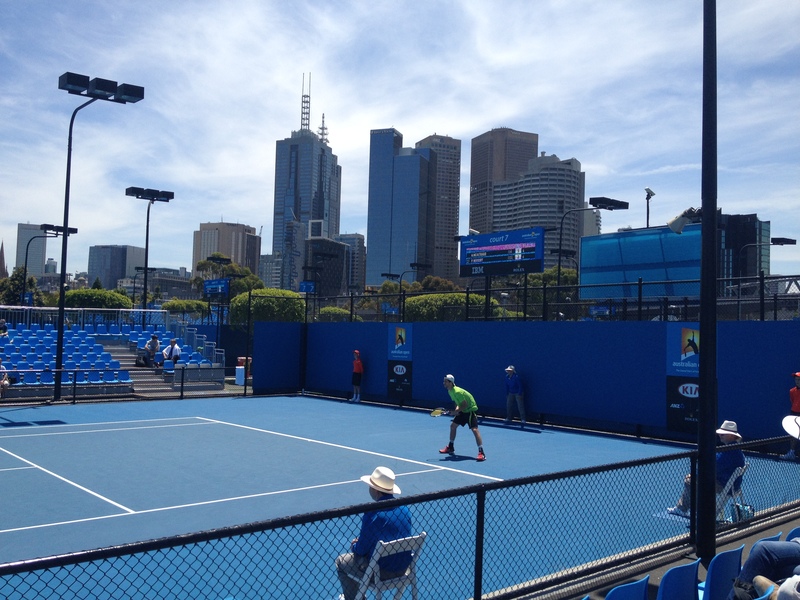 The exception, today, was at the Australian Open qualifying, which for seriousness leaves even the Hopman Cup behind. While Thompson was almost saving Australian men’s tennis across town, only one of ten Australian men had so far progressed past the first round of qualifying. This one, for the record, was Andrew Harris; he played a fine match to see off Italian Simone Vagnozzi in straight sets. Later on John-Patrick Smith also moved through, albeit by defeating fellow-Queenslander Ben Mitchell. Marc Polmans was roughly schooled by Paul-Henri Mathieu, which is appropriate since the Australian is still school-aged, though this doesn’t justify his rocking a legionnaire’s cap. Both Alex Bolt and Luke Saville contrived to lose 11/9 in third sets, to Axel Michon and Paul Capdeville respectively. Capdeville was one of the few non-Australians to enjoy vociferous support today, with a respectable Chilean contingent thoughtfully redoubling their exhortations after he hurled his guts onto court. Otherwise, nationalistic fervour rarely attained more than a low simmer. When Yuki Bhambri saved a match point against Potito Starace the resultant applause was far too thin even to be termed a smattering, and it faded to nothing once the Italian actually won. James McGee had a small Irish contingent on hand, and did his best to reward their support by wearing patriotic wristbands, and by putting up a terrific fight against Jimmy Wang. Ruben Bemelmans easily saw off Filip Peliwo, watched over by a surprisingly unconcerned David Goffin – it transpired he’d already withdrawn – and Xavier Malisse, whom retirement seems to be treating well. I’ve hardly seen Bemelmans hit the ball better, though mostly he just had to keep it deep, secure in the knowledge that Peliwo’s flashes of brilliance, though frequent, were unlikely to coalesce into a real threat. It was never a long wait before the Canadian risked everything. Oscar Hernandez pulled off the rare feat of making Pere Riba look (comparatively) like a big hitter, but not the rare feat of winning a professional tennis match. Ricardas Berankis won his first round comfortably, but then he always does. Diminutive stature and too many injuries have conspired to grant his ranking neutral buoyancy, and he is at risk of becoming a qualifying fixture. Flavio Cipolla sliced Filip Krajinovic to shreds, gradually and noisily. Amir Weintraub reached the second round of the Australian Open main draw last year, but today lost in the first round of qualifying to Pierre-Hugues Herbert. His ranking will consequently drop out of the top two hundred. Weintraub was a clear class above Herbert in the first set, his lovely backhand equal parts lethal and secure. He was driven on by a lone fan in the stand, a fan whose voice nonetheless boasted the dulcet resonance of a foghorn. Some in the crowd appeared irritated by these passionate imprecations, but I thought they imparted a little atmosphere to the match that too many other matches were lacking, and set up a lovely call-and-response with the service line judge, a full-chested baritone whom one suspects would make an admirable Lear. By the time I returned to Weintraub and Herbert, the latter was up a break in the third, his superior serve dominant. The encouragement flowing from the stands was now all French. Weintraub nonetheless broke back with a mighty effort, and the score reached 6/6, with the Israeli to serve. Herbert won the first point, whereupon he was intrigued to discover there was no tiebreak in the final set of Australian Open qualifying. All the confusion was French: ‘No tiebreak? No tiebreak? !’ If he was dismayed by this, though, he didn’t let on; he quickly broke to 15, and served it out. The two men clasped hands, one exultant, the other stricken. Unlike Kooyong, where the magical moments mean little, this meant a great deal to both. It means a great deal to all the men here. This is their life, whether that life is based here or far away. But it doesn’t mean everything. As he left the court Weintraub was met by his fiancée, her pretty face resplendent with a consoling grin. She took his hand, he smiled back, and that’s how they walked away. 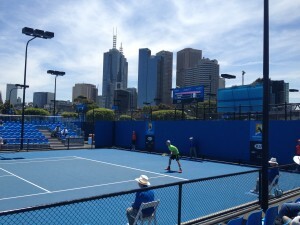 Thanks for the interesting post on Australian Open qualifying matches. We don’t hear a lot about qualifying, so it’s great to have a window on that part of tennis. My pleasure. Was a fun day. Normally I go to a lot more qualifying, but other commitments have a way of surfacing. And now a final for Lu, beating Ferrer. Outstanding – here’s hoping he can really take it to Isner. Thanks so much for this, Jesse! Such a comfort to read that, at least, Amir could smile back at his girlfriend after his match… I was devastated for him, even if I quite enjoyed seeing Pierre-Hughes Herbert play at Bercy… Merciless draw when you’d like to see both players do well. Thanks also for your positive assessment of Ruben Bemelmans performance… Belgium can really use any half magical moment that presents itself those days. While our national sports pride is in no danger to compete with such nations as Australia, US or the UK, it still makes us somewhat nostalgic to realize we have no player left in the top 100 and the only chances to have one Belgian male player in AO main draw rest now on Ruben Bemelmans’ shoulders. David Goffin’s injury must be such a disappointment to him, after his successful revalidation from a broken wrist… His recent performance at one of those irrelevant exho tournaments (Open of Caen), beating Richard Gasquet in the final, was splendid! I’m liking Bemelmans chances to beat Dzumhur for a spot in the main draw, but then I’ve liked everyone’s chances against Dzumhur so far, and look where that’s gotten me. Spare a thought for us here in Melbourne. We’re about to be slugged with apocalyptic heat. Monday will be a pleasant 34 or something, but from then until at least the weekend there isn’t a day below 38. I pity the players consigned to outside courts for the first week. Sparing many compassionate thoughts for players and spectators in this coming heat… 38°C is not a temperature to play tennis or do anything much really – apart from playing soccer in Qatar. At least Your Leyton kind of got used to it in Brisbane… He may have a competitive edge this week? I’m sure Bosnia-Herzegovina is proud to have a player in the main draw… Let’s be happy for them too! You are as ever the soul of generosity. I’m actually a bit concerned about the heat this week. Looks like there might now be 3 days over 40C. Urgh.